As I was mentioning in „limitless – what you resist persists” that we come to this world with a generous reservoir of outstanding qualities. We are meant to be a genius each one of us! This qualities are like muscles, the more you train them the better you perform. To master a skill, to be like Michael Jordan or Mozart you simply have to train your qualities 10.000 hours. This is it, so simple. The 10.000 Hour Rule is usually attributed to the research done by Anders Ericsson in the early 1990s. He and his team divided students into three groups ranked by excellence at the Berlin Academy of Music and then correlated achievement with hours of practice. They discovered that the elite all had put in about 10.000 hours of practice, the good 8.000 and the average 4.000 hours. No one had fast-tracked. This rule was then applied to other disciplines and Ericsson found that it proved valid. Malcolm Gladwell is the man who has brought new attention to the 10.000 Hour Rule in 2008 with his book Outliers: The Story of Success. This book was very inspiring for me and I highly recommend it to understand what stays behind most successful people in this world. Where are my 10.000 hors waisted? It is very clear for me that I should do a specific thing/activity to master it. I started to calculate where did I put most of my time. 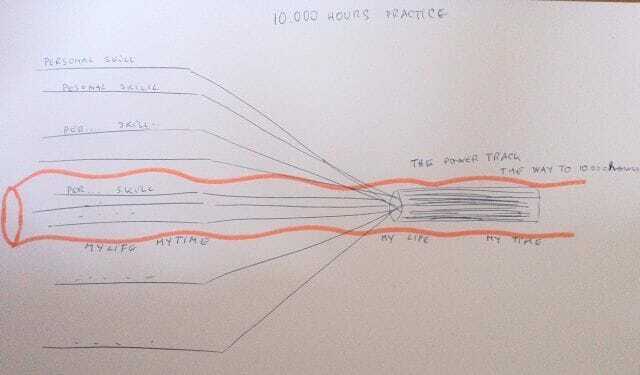 Which activity is the one closest to 10.000 hours practice. I started to calculate hours but something was missing. Sometimes the activity was to general or it was specific but too less hours. It is so visible how I spread my time in doing this and that, trying different activities or most of the time entering some known professional tracks where after a good amount of time I changed the path. Why didn’t happened? I see now very clear that you cannot do 10.000 hours of the same activity without loving it. And you start loving what you do when the activity is based on your personal skills you was born with. Yes you cannot enjoy training a muscle you don’t have. Imagine being a person who likes people, who likes moving in different places, facing new situations, inspiring people, but this person spends 8 hours a day sitting in an office and working in front of the computer. This will not work and I see it very clear from my experience.